If you’ve been vaguely aware of recent oil news, you may have heard conspiracy ideas and theories regarding the current administration’s dealings with Russia and OPEC (the oil cartel dominated by the Middle East), and how our administration is and may be attempting to coerce them into increasing oil output – thus lowering the price of oil, and very indirectly, the price of gasoline at the gas station. Should we be conspiring with Russia and OPEC on oil matters? Yes, we probably should. Just not in the way this administration is currently going about it. For the first time in nearly 50 years, and with the fossil fuel era slowly coming to an end, the Unites States is actually the world’s top oil producer! That’s right, thanks to shale and fracking, the U.S. is set to produce more oil than anyone else! In an increasingly competitive world that buys, for example, fewer American automobiles, oil is now one of America’s top products, and it could easily become America’s flagship, top-selling product. What do you do when you have the most of something, and that something is extremely valuable and extremely finite? Well, what you don’t do is attempt to sabotage the price of that commodity, in what can only be characterized as the laziest, least-thought-out, most off-the-cuff policy in recent memory. 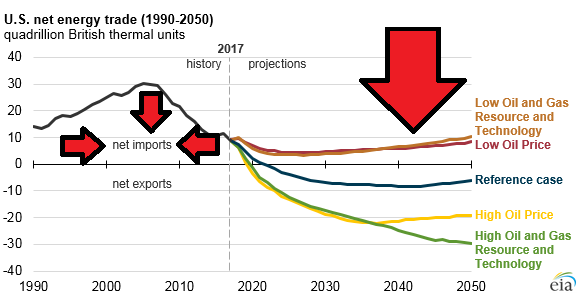 My back-of-the-envelope estimate for the amount of profit¶ lost, over 30 years, when comparing the low-oil-price scenario to the high-oil-price scenario is $20 trillion ($20,000,000,000,000) – roughly our current national debt. I’m not an expert, and I certainly encourage you to come up with your own estimate. Once our oil reserves are depleted§, that’s it! When it’s gone, it’s truly gone. We’ll never have it again, and we’ll never be able to sell it again! So why are we trying to deplete this trillion-dollar resource at the lowest possible prices!? There are two things you can know with absolute certainty. One is that no other country will voluntarily pay down our national debt for us. The other is that they will all fervently – and, eventually, some of them violently – demand that we pay them when their American treasury bonds mature. We will need to find extraordinary sources of income‖, and charging foreign nations a higher (and arguably more fair) price for our precious natural resources is one of the few ways to achieve that goal. Meanwhile, we are being sold a ludicrous self-sabotage strategy as an ingenious, indirect way of lowering gasoline prices by dimes, nickels, and pennies. This line of thinking hits every possible dead end, signaling that, as suggested above, it hasn’t actually been thought out. Feel free to follow along in the next four paragraphs if you’d like to see for yourself. First, the voters who could theoretically be “bribed” by this Republican administration’s scheme are obviously lower-income citizens. Unfortunately, these Americans spend all their time making ends meet. They don’t have much time to keep up with current events, much less politicians. More to the point, they don’t vote, don’t care about voting, don’t want to vote, and have decided at some point that voting won’t improve their lives in any tangible way – at least not enough to make voting worth their time. The last segment of low-income voters, who actually vote, but might not vote Democrat, are habitual Democrat voters who are disaffected. This demographic will defect or not defect based on the president’s many other grandiose policies※ – not the price of gasoline. (Similarly, the president was propelled into office by these grandiose ideas and policies – not the price of gasoline.) In other words, even within this ultra-ultra-low percentage, inconsequential voting bloc, it will still not make any tangible difference! Why are we attempting to sabotage the price of one of our most valuable, most finite commodities? And attempting to do so at a very unique time when we have the largest amount of that commodity? This is not dominance. This is a major violation of our business, economic, and national interests. † This would require a new regulatory agency to coordinate American supply cuts in a meaningful way that makes sense. The United States is a free market, except when we’re not. For instance, it’s illegal to have a powerful domestic monopoly, and our military industrial complex can’t sell weapons to North Korea. And the list goes on an on. When there’s a compelling reason for state intervention or guidance, the United States does not hesitate to act and make the necessary adjustments. The advent of America becoming a major oil exporter in a trillion dollar market is clearly way beyond the threshold that is required. It clearly makes sense to take the necessary steps that will benefit America and all American oil companies, collectively. Indeed, this is the very reason OPEC was formed. Oil exporting nations realized it made no sense to fight each other tooth and nail in the marketplace and in the process make very little profit. If OPEC can figure that out, I don’t see why we can’t. ‡ As it stands, America shows no credible interest in becoming financially solvent, and we pay off American treasury bonds by selling more American treasury bonds. Therefore, an impending corollary to the issue of our national debt, is the issue of who exactly is going to keep purchasing our American treasury bonds – effectively financing our existing national debt – if we cannot or will not show initiative – any initiative whatsoever – to become financially solvent. If America acts like a deadbeat consumer, then other countries will stop financing our national debt for us. The national debt is our national credit card. You can’t keep running up debt on your credit card without demonstrating to your lenders a credible plan for how you will become financially solvent; otherwise, they eventually cut you off, and if you then default, they send in debt collectors. ¶ Generally speaking, profit equals revenue minus costs, and as you’d expect, that’s the value that’s being estimated. However, regardless of how much it costs to produce a single barrel of oil, a healthy part of those costs are cycled back into the economy. Whether it’s more steel being purchased, or more oil rig workers being employed, there are maybe a dozen industries that get “put to work” so that a barrel of oil can be produced. Said differently, the total price of a barrel of oil, and certainly each barrel that is exported abroad for sale, is as close to “pure profit” as you will find in the American economy. 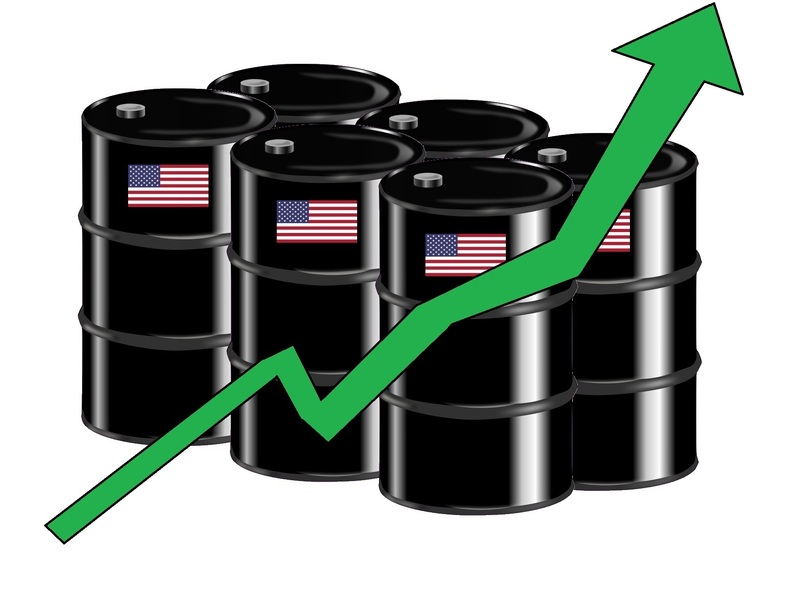 § There are many competing models that estimate when oil will run out. When it’s your well being on the line, it makes sense to be conservative and assume oil will run out sooner rather than later. However, it actually doesn’t matter. 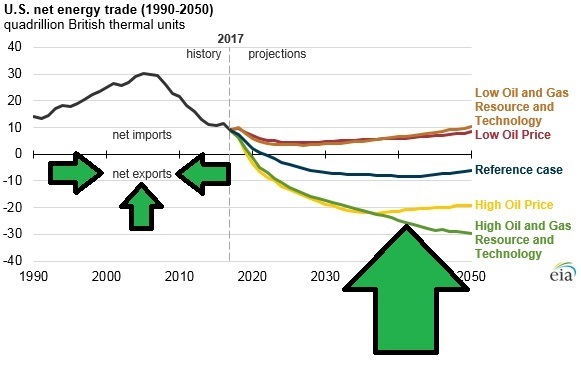 From America’s point of view, the same financial end result will occur once the world has transitioned to renewable energy, and this transition is already in progress. Either way, we will no longer be able to sell this natural resource for significant profit; the window of opportunity is right now. ‖ Hint: Since no interest group is willing to give up its special project(s) or operation(s), the solution, realistically, is to find new, extraordinary sources of income, hopefully matched with improved efficiencies in existing projects and operations. ※ Taking a look at just one of these huge, sweeping policies, we are now in the middle of a bitter trade war with China. Superficially it’s over legitimate trade disputes, but under the surface, it’s also about confronting a strategic competitor. (My only opinion on the matter is that we should either have the trade war, or not have it. Having a muddled, implication-less skirmish makes little sense to me.) And so, what I do not understand is why, in the middle of this huge, strategic confrontation with China, this anti-China administration is simultaneously angling to have our extremely precious oil practically given away for free to China – allowing them to continue development at breakneck speeds, on the cheap, thanks to us?… I can only refer back to the original thesis for this blog post. ₡ Not surprisingly, this is exactly what Saudi Arabia does. Since they’re a major oil exporter, they don’t sabotage their own oil industry in order to shave cents off the price of internal gasoline usage. Instead, for that particular objective, they simply set the price of gasoline inside Saudi Arabia – and in the past it’s been extremely cheap. In our case, I suspect a rebate or tax credit system is much more workable – funded by taxation on oil profits above a certain baseline. Although it’s an extraordinary measure aimed at bringing down the price of American gasoline, it’s no less extraordinary than the haphazard, fly-by-the-seat-of-your-pants self-sabotage of America’s energy industry. If we believe the price of American gasoline is that important, then by all means, we can afford to take extraordinary measures, but let’s make sure they actually make sense.